2005 is the first year of the analysis as it is the first year of the global adjustment. It is notable for a higher average commodity rate, which is understandable as that year marked the peak demand in Ontario and its major export markets, New York and Michigan. While higher pricing is easily explained by higher demand, the RPP (regulated price) being below the average price is not. 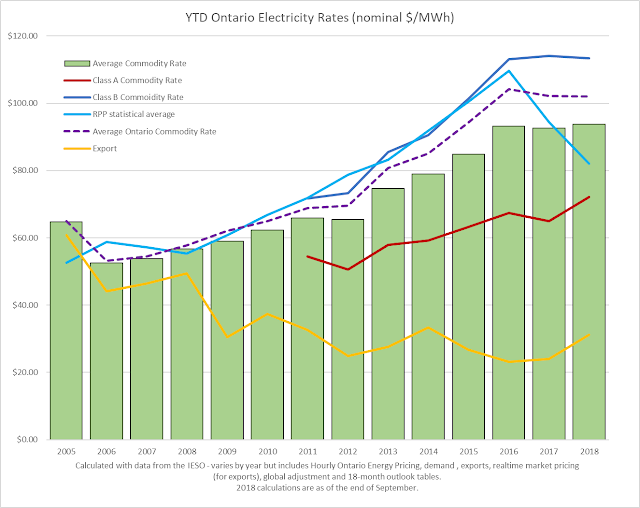 To understand the situation in 2005 it's important to realize Ontario had been served by a single integrated utility until it was broken up in 1998, and the market structure intended to replace it started up in May 2002. Soon Price spikes spooked the government of the day, who then froze rates. To control costs a Market Power Mitigation Agreement (MPMA) was introduced wherein the public generator (Ontario Power Generation, or simply OPG) was required to pay back revenue above a certain cost, and that money would flow back to Ontario consumers. That system ended in 2005, replaced by the global adjustment that allowed the full recovery of supply costs, regulated rates on OPG's largest generators (nuclear and very large hydro), and a price cap on OPG's other generators (including coal and smaller nuclear). From 2006 to 2008 prices among all consumer groups were similar - as they should have been with RPP rates set according to the predicted costs and demand over the next 12 months. In 2009 the recession hammered demand and, with it, market pricing. With exports unburdened by the global adjustment charge/true-up, it's at this time export rates become far cheaper than the average commodity cost (which should equate to the average cost of supply). Since 2009 the average cost of Ontario supply is significantly higher in Ontario than for export markets. With the price rising as new supply contracts entered service while demand stagnated, or worse, the global adjustment mechanism was revised for 2011. A new class of consumer, "A", was allowed to greatly reduce its costs by controlling consumption during the 5 highest daily IESO system peaks. This simply shifts costs from one class of Ontario consumer to another, so from 2011 to 2016 the remaining consumers (Class B and the closely related RPP customers), move much higher than the average costs. The steep drop in RPP pricing that begins in 2017 and continues in 2018 is due to the [un]Fair Hydro Plan. That plan borrows from future ratepayers to the benefit of today's RPP consumers - with the scope of the borrowing reflected in the gap between the light blue "RPP" line" and the dark blue "Class B Commodity Rate" line. In addition to the rate decline indicated in this post, a debt retirement charge of $7/MWh was eliminated from RPP consumer bills as of 2017. The average commodity rate has changed very little in the past 2 years. There are different reasons for this in each year, but one situation to watch is the Class A pricing. It is up quite sharply in 2018, although that impact is mitigated by the end of the $7/MWh debt retirement charge for this consumer class as of early 2018. I hope to see more evaluation of whether the [un]Fair Hydro Plan is benefiting today's local distribution companies at the expense of future ratepayers. The current RPP rates were calculated based on estimated class B costs of $126.37/MWh (for the period from May 1, 2018 to April 30, 2019), but the rate has been significantly below that over the first 5 months of the period. If the IESO is paying local distribution companies (LDCs) a $44.38/MWh "Global Adjustment Modifier", they are effectively paying an extra $10/MWh for electricity to today's LDCs at the expense of tomorrow's ratepayers. This could provide a challenge to the regulator (the Ontario Energy Board) which is both responsible for setting the "modifier" and for ensuring electricity is a flow-through cost, and not a profit centre, for the LDCs they regulate.